History, Permanent Collection of Modern Art & Design. New Wing dubbed "The Bathtub". Innenraum (1981) by Anselm Kiefer. The Stedelijk Museum Amsterdam - one of the best art museums in Europe - specializes in modern art, postwar contemporary art, and design, from the early 20th century up to the 21st century. The museum receives roughly 700,000 visitors per year and is the 4th most popular museum in the Netherlands. Located at Paulus Potterstraat, close to the Rijksmuseum and the Van Gogh Museum, its permanent collection consists of some 90,000 items, embracing painting and sculpture, as well as drawing, fine art photography and installations. It features representative examples from all the main modern art movements, including works by Vincent van Gogh, Wassily Kandinsky, Ernst Ludwig Kirchner, Marc Chagall, Henri Matisse, Jackson Pollock, Karel Appel, Andy Warhol, Willem de Kooning, Francis Bacon, Georg Baselitz, Anselm Kiefer and Gilbert & George. Other galleries of fine art in the Netherlands include: the Kroller-Muller Museum Otterlo (Gelderland), Museum Boijmans Van Beuningen (Rotterdam), and Mauritshuis (The Hague). The Stedelijk Museum was established in 1874 by a group of art collectors and wealthy individuals led by C.P. van Eeghen, who donated funds as well as their art collections to inaugurate a museum in Amsterdam, dedicated to modern art. The Stedelijk collection moved into its own building - a Dutch Neo-Renaissance style structure, designed by Adriaan Willem Weissman and funded by Sophia Adriana de Bruyn - where it opened to the public in September 1895. To begin with, the museum deliberately maintained a diverse, eclectic assembly of objects, but from 1920 onwards the collection focused on modern art and (later) postmodernist art, together with pioneering collections of design art and photography. In 1934 a new separate section on applied art was opened, which was augmented further in 1945. This featured graphic design and poster art, furniture, stained glass art, batik, metalwork and ceramic art, as well as textiles, tapestry art and some small-scale sculpture. In addition a department of printmaking and works on paper was opened in 1954. A new period of growth took place after 1945, after curator and designer Willem Sandberg was appointed Director. As well as extending the collection and working closely with many artists, Sandberg launched a far­sighted program of exhibitions that transformed the Stedelijk into one of the best galleries of contemporary art in Europe - a program since renewed by later Directors such as Edy de Wilde (1963 1985), Wim Beeren (19851993), Rudi Fuchs (19932003) and Gijs van Tuyl (20052009). In 1954, for instance, a new area known as the Sandberg Wing was built to accommodate new types of avant-garde art. Two years later, a a new auditorium to show film screenings and musical performances was added. By the mid-1970s, the Stedelijk had become a museum devoted exclusively to modern art.. The museum's art collection has grown along the way, thanks to donations, bequests and a careful program of acquisitions. During the 1940s and 50s, for instance, important works by Ernst Ludwig Kirchner and Henri Matisse were added to the collection; also during the 50s, the museum acquired a series of works by the Russian Suprematist Kasimir Malevich, as well as design works by De Stijl, the Bauhaus Design School and related design movements such as Russian Constructivism, as well as Kinetic art, the COBRA group, and Pop art. Also during the 1950s the Stedelijk started collecting photographic works by some of the greatest photographers, including Erwin Blumenfeld, Laszlo Moholy-Nagy and Man Ray, as well as Dutch photographers Eva Besnyo, Ed van der Elsken and Cas Oorthuys). In the 1970s, the museum branched into video art, sourcing works by European artists like Gilbert & George and Dibbets, Bruce Nauman and (later) Nam June Paik and Bill Viola. In 2001, drawings by El Lissitzky and other avant-garde Russian artists originally in the collection of the Khardzhiev-Chaga Cultural Centre were acquired, adding to the museum's assemblage of Russian art. Coinciding with its privatization in 2006, the Stedelijk entered into partnerships with other foundations and collections, and underwent a major program of renovation, reopening in September 2012. - La Montagne Sainte-Victoire (1888) by Paul Cezanne (1839-1906). - La Berceuse (1889) by Vincent van Gogh (1853-1890). - Paysage de Bougival (1906) by Maurice de Vlaminck (1876-1958). - Landscape at Dangast (1910) by Karl Schmidt-Rottluff (1884-1976). - Stilleben mit Holzfigur (1910) by Erich Heckel (1883-1970). - Nacktes Madchen hinter Vorhang (Franzi) (1910) by Ernst Ludwig Kirchner. - The Violinist (1912) by Marc Chagall (1887-1985). - The Woodcutter (191213) by Kasimir Malevich (1878-1935). - Circular Forme. Sun and Moon (1912) by Robert Delaunay (1885-1941). - Tableau III: Oval Composition (1914) by Piet Mondrian (1872-1944). - Suprematist Composition in Red (1915) by Kasimir Malevich. - Odalisque (1920) by Henri Matisse (1869-1954). - Pierrot (1920) by Georges Rouault (1871-1958). 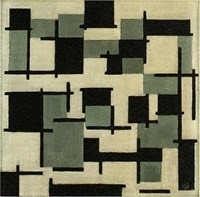 - Contra-compositie V (1924) by Theo van Doesburg (1883-1931). - La maison à travers les Roses (1925) by Claude Monet (1840-1926). - Reflection of the Big Dipper (1947) by Jackson Pollock (1912-56). - Le voyageur de Munich (1959) by Asger Jorn (1914-73). - Untitled (1960) by Robert Ryman (b.1930). - Belevue II (1963) by Andy Warhol (1928-87). - From Muybridge 'The Human Figure in Motion (1965) by Francis Bacon. - Fingermalerei - Akt (1972) by Georg Baselitz (b.1938). - Innenraum (1981) by Anselm Kiefer (b.1945). - Two Color Frame Painting (1984) by Robert Mangold (b.1937).  For more about modern and contemporary painting in the Netherlands, see: Homepage.